Apart from being a good source of Vitamins A, C, K, folate and potassium, Tomatoes are also naturally low in sodium, saturated fat, cholesterol, and calories. Tomatoes also provide essential minerals like thiamine, niacin, magnesium, phosphorus and copper, all of which are necessary for good health and absorption of other Vitamins. The vitamin K and calcium in tomatoes are both very good for strengthening and repairing bones. Hence eating Tomatoes help in reducing the risk and pain of Osteoporosis naturally. Tomatoes help in reducing the Risk of Heart Disease, by providing good quantities of Vitamin B6 and Folate. Tomatoes are one of those every few vegetables that are beneficial equally when eaten raw or cooked. When eaten raw, tomatoes give you a good supply of Anti-oxidants. And when cooked with some oil, tomatoes release essential juices which help in the digestion of food and absorption of other nutrients. It has been found during research, that there is not much difference in the nutritional value of Organic produce and non-organic one. So you can have lots of tomatoes in various form, without emptying your pocket on expensive Organic products. Tomatoes are relatively cheaper to buy than most of the vegetables and easily blend with any dish or cuisine. Which means- more flavour and less spending. So.. you see now! Why tomatoes are so good for you and should be included in your everyday diet! Let’s get to the recipe now, shall we? 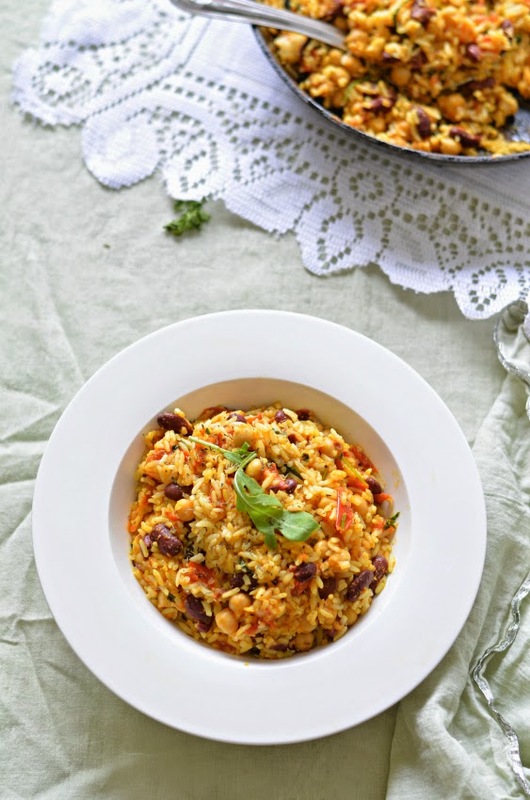 This recipe of Tomato rice is a very simple One Pot Meal, for those lazy evenings when you don’t want to cook anything fussy and still want to tug nutrition in. Oh ! did I outline my weekdays here? Well, yeah I guess.. Most of my Mondays I am not in a mood to cook anything elaborative and you know how much I hate packaged food. So, mostly on Mondays I go for simple rice recipes with loads of vegetables in it. So I don’t get to tire myself up in the kitchen for long hours, still get to see my plate colourful with a balanced meal. What makes this dish a wholesome meal? – For starters, it has tomatoes. Loads of them. So its rich in essential minerals and antioxidants anyway. Then it has essential Carbs that come from Rice. If you are worried about the starch present, use a good variety of rice, like Sona Masoori or Par boiled rice and you are sorted. I am not in favour of using brown rice in every dish, but that’s for some time later. Anyway, so apart from rice and tomatoes, we add beans in this pot. I have used Garbanzo beans ( which is Chickpeas simply ) and Red Kidney Beans in my preparation. But you may add any variety you like for example – Butter beans, Black eyed beans, Black chickpeas etc. as per your taste. So that gives us a lot of plant Protein for the day. And then some herbs and spices added, will impart flavour, and also enhance digestive and medicinal properties of the dish altogether. At last, some oil – for little fats which is important for cooking food properly and assimilation of nutrients with each other. So you see, how we made such a simple meal a powerhouse of nutrients! 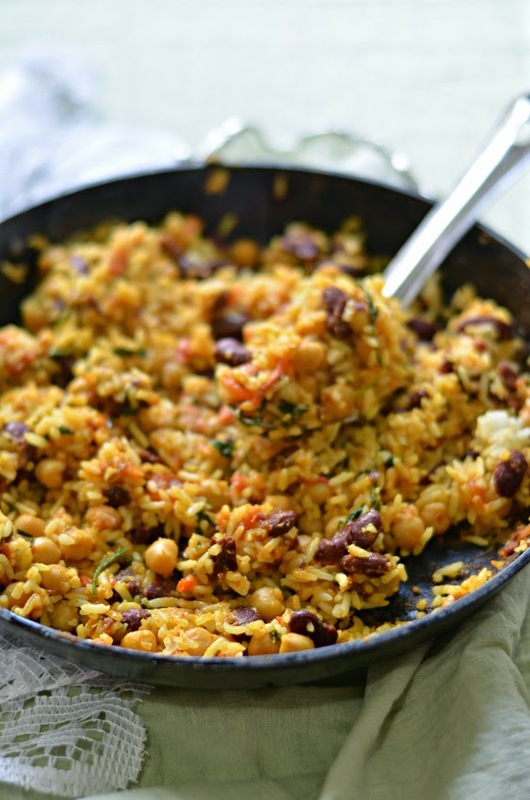 It’s a mix of Indian and Mexican flavours and has a lot of scope where you can increase or decrease the quantity of spices/ herbs making it match your taste buds. Let’s not wait and grab the recipe to keep those lazy evening simple and yet not unhealthy at all. Puree all these tomatoes in a blender and keep aside. Now add in the tomato Puree and mix well. Add in all the spices and give a nice stir. Cook this sauce covered for next 3-4 minutes, stirring in between. It should get thick by the end. Keep the flame low all the time. Now, once the sauce has gotten thick and all mushy; add in beans or any vegetable that you are using. Mix well so the sauce is coated evenly. Cook this further for 5-6 minutes on a medium flame. Add a few spoons of water if its too dry and sticking to the bottom of the pan. At last, add cooked rice and gently mix it with the sauce and beans. Take care not to be too harsh with the stir or the rice will get all mushy. You only need to cook it for another minute or so uncovered and then switch off the flame. Sprinkle chopped cilantro on top, crack some black pepper and serve hot with Raita, Poppadom or Pickle. Whichever beans you add, just be careful about their texture. Like for chickpeas, you can cook them for longer time in the sauce and they will still their shape. 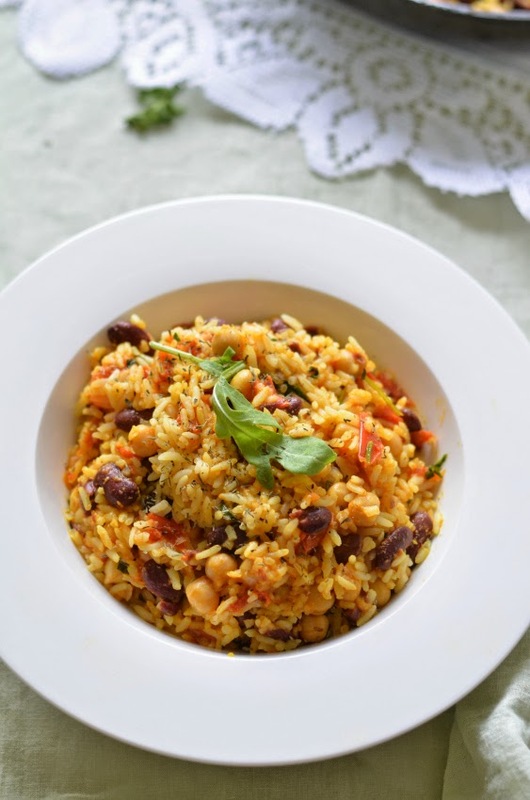 While red kidney beans will go all mushy if you cook them for longer. So whatever mix and match you do, take care about this factor or you will end up eating a Risotto textured rice pot instead of all fluffed up and grainy one. You may add some vegetables into this like Potatoes, Green peas, cauliflower, broccoli etc. Just make sure you blanch the vegetable before you add it to the sauce so that it retains its texture yet gets cooked properly and is soft enough. Use rice only after the steam is off and its at room temperature, else it will get all mushy.You may plan ahead and make Rice 4-5 hours before you plan to serve the dish. You may also sprinkle some dried herbs like Parsley or Thyme on top before serving. Never tried using olive oil as I felt, tandoori spice-mix n olive oil don’t go well together 😉 Next try with your recipe!! !